This contact us page is dedicated to providing the site visitor with quality Elvis Presley biography information, pictures and articles for your entertainment. 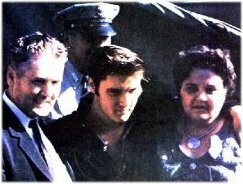 The contents of this Elvis Presley biography site is written by a fan for his fans. Elvis Presley biography site webmaster can be contacted on the form below. If you have any questions about anything you have seen on Elvis Presley biography site or would like to contribute your story about Elvis to be considered for inclusion on this site, please write to us via our form below. Elvis Aaron Presley, in poverty, to Vernon and Gladys Presley in a two-room house in Tupelo, Mississippi on January 8, 1935. He and his parents moved to Memphis, Tennessee in 1948. In 1954, he began his singing career with the legendary Sun Records label in Memphis. In late 1955, his recording contract was sold to RCA Victor. By 1956, he was an international sensation. Globally, he has sold over one billion records, more than any other artist. His talent, good looks, sensuality, charisma, and good humor endeared him to millions, as did the humility and human kindness he demonstrated throughout his life. Elvis died at his Memphis home, Graceland, on August 16, 1977. "I ain't no saint, but I've tried never to do anything that would hurt my family or offend God...I figure all any kid needs is hope and the feeling he or she belongs. If I could do or say anything that would give some kid that feeling, I would believe I had contributed something to the world." -Elvis commenting to a reporter, 1950's. `Don`t criticize what you don`t understand, son. You never walked in that man`s shoes.` -Elvis often used this adaptation of a well-known quotation. -From his acceptance speech for the 1970 Ten Outstanding Young Men of the Nation Award. Given at a ceremony on January 16, 1971. -Talking about the informal jam sessions he and the band and entourage enjoy each night during the lengthy Vegas engagements. These happen upstairs in Elvis` suite at the Las Vegas Hilton as they all try to `wind down` from the excitement and energy of the live shows. Quote is from a 1972 taped interview used in MGM`s documentary `Elvis on Tour`. -Said in 1977 at the end of a concert during his last tour. Elvis Presley (1935 — 1977) US singer, actor In "Rand Lindsly's HUGE Quotations File," an Internet collection of quotations. Elvis Presley (1935 — 1977) US singer, actor I have no use for bodyguards, but I have a very special use for two highly trained certified public accountants. Elvis Presley (1935 — 1977) US singer, actor In "Webster's Electronic Quotebase," ed. Keith Mohler, 1994. I knew by heart all the dialogue of James Dean's films; I could watch "Rebel Without a Cause" a hundred times over. Elvis Presley (1935 — 1977) US singer, actor In "James Dean in His Own Words," 1989. John Lennon (1940 — 1980) English singer, songwriter, musician. Interview for KFRC RKO Radio, given 8 Dec. 1980, the day of Lennon's murder. Johnny Carson (1925 — 2005) US talk show host, comedian In The Ultimate Success Quotations Library, 1997. People ask me where I got my singing style. I didn't copy my style from anybody . . . . Country music was always an influence on my kind of music. Elvis Presley (1935 — 1977) US singer, actor In "The Book of Country Music Wisdom," ed. by Criswell Freeman, 1994.